Let’s see if we can gather additional more precise information about the universe when we consider the overall space volume drawing we used previously. -First, by changing the basic space volume we use. Here we will choose a basic space metric within 11 and 1 hour of the previous chosen basic metric volume of the original drawing. -Second, we will install a gluon, followed by the three generations of fundamental hadronic particles (blue) and antiparticles (red) issued by decay, where and when we have space, in the area between 7 and 5 hour. Considering the first option, we discover that whichever basic space metric we use, each possesses the Universal Time flow because each is a center of the universe. But we’ve seen this already. On the other hand, this could mean that the space metrics Time flows are relativistic to each other even if Time has an “absolute” flow. b)	Unequal time laps are shown between the possibility for each fundamental particle (generations) to transform (decay) into less massive articles. These time laps cannot be shorter than the number of basic time laps (metrics) shown on the drawing (but have to be longer as we will see). And now, it’s essential to be aware that the white “dot” representing a gluon doesn’t have a diameter of 10^-35 meter as do have basic space metrics; it has a diameter of 10^-15 meter. So we are viewing an event completely independent from the original expanding space volume represented by the original drawing; thus confirming the independence of “birth dates”. And we realise that the time laps between decays have to be longer that the number of duplicating “expanding” basic space metrics between the events, because the production of the each needed volumes for hadrons cannot exceed light speed. This simple fact could explain why we can observe “matter” more easily than “space”, since it takes more time to cover 10^-15 meter at light speed than it needs to cover 10^-35 meter. This “hadronic” part of the drawing represents the evolution of the “inflating” space portion of our universe and this “inflation” occurred “within” the original expanding space volume. As for the “time laps” between generations, it would be important to find if volumes of basic “gluon effect” (10^-15 meter) has to duplicate itself to define those time laps between decays (generations). The “life span” of each hadronic particles should give that answer. Three generations of “time flows”. Just to confirm that the universe always develops the process that is needed at the next evolution step (in fact, evolution simply follows the “viability steps” trajectory), there was three generations of time flows produced just before (and the same process was repeated for) the appearance of the three generations of fundamental particles; which were also related to the times flows as seen in the previous post. Making abstraction of space production (except for the angles of flows), the Time flow is an excellent track to follow, thus understand, the universe’s evolution. 1-The Universal space time flows are issued from the Planck’s epoch single Time flow. 3-all particle time flows are issued from the “added” space inflating time flow (in fact from the gluon’s time flow); so those last flows are completely independent from the original Universal space time flows; just as inflation is completely independent from expansion. The following drawing shows all Times flows that developed starting from Time = zero to the production of the Top and AntiTop quarks during inflation, which started at the gluon appearance just after the Big bang’s radiating period. Note: Time flows are always installed at the angles defined by basic space metrics production: 1 – 3 – 5- 7 – 9 – 11 hrs, on in the Universal Time flows which defines the "birth dates". This drawing also explains where the defining process of six fundamental quark particles comes from. The six inflation times flows is the process that the universe will use to define the successive number of quarks "viable": six quarks and six antiquarks. 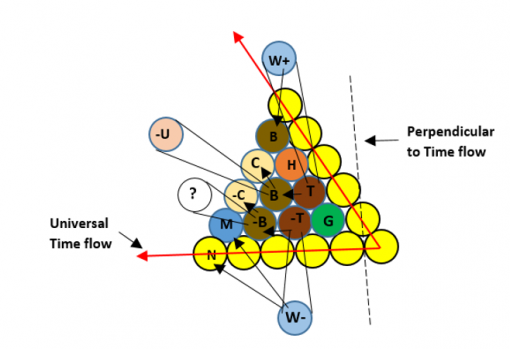 Which suggest that leptons are related strictly to the six angles of the Universal flows. I'll have to look deeper at this last suggestion. Was there asymmetry between particles at the beginning? While writing my latest book, to be edited soon, I met a problem that I didn’t solve completely. The problem was regarding the asymmetry we assume existed between elementary particles since, after the annihilation period, all antiparticles had disappear. In my mind, it’s not possible that an asymmetry existed; because there’s no way that you could have had more front surfaces than back surfaces of gluons to produce quarks and antiquarks. So there has to be another explanation. The only logical explanation I can see relies in the successive steps tried to finally attain equilibrium by “joining” three quarks or three antiquarks. First step has to be Mesons that tries joining simultaneous quark – antiquark production; and mesons revealed unstable. All other steps had to be tried until a stable association was obtained. One of those steps could have been “Pentaquarks” made of five quarks (but there are others that I didn't check yet). Theory does not forbid the existence of a short-lived five-quark particle, and scientists have looked for them in the debris of particle-smasher experiments for decades. Having turned up nothing, they were beginning to think they had missed some rule of nature that bans Pentaquarks from forming. Science has recently discover, at LHC, that exotic particles were effectively tried in the evolution of the universe. One of those exotic particles which proved to have existed, is the Charmonium-Pentaquark composed of a Proton (uud quarks) united to a Charm meson (C + anti-C quarks). The discovery of Pentaquarks was described as an "accident" and "something we’ve stumbled across" by a CERN spokesperson. And since their asymmetry research was made with, in mind, the "strong "interaction" notion, the "accident" didn't mean too much. Nevertheless, since I don't believe in the strong "interaction", let’s consider a “Proton - C meson” Pentaquark exotic particle with its anti-Pentaquark particle. 2) As a Meson-baryon “molecule”. Which, by the way, will be the process used, a bit later, by evolution to assemble particles into molecules. Were those quarks protected from annihilation inside Pentaquarks? At first glance there’s no objection to their existence. But let’s check a bit further and put in the electric charges of each quarks. Pentaquark = (-1/3) + (+2/3) + (+2/3) + (-2/3) + (+2/3) = 3/3 which is a Proton. Anti-Pentaquark = (+1/3) + (-2/3) + (-2/3) + (-2/3) + (+2/3) = -3/3 which is an Anti-Proton. BUT...If there was more Pentaquarks then anti-Pentaquarks produced, then, Protons would have predominated. Added to this that if a Pentaquark can be made of a Neutron + a Charm meson, we then get a surplus of Neutrons. Whatever the surplus of Pentaquarks, it does solve our problem. And this could be the explanation of finding, exclusively, particles in our actual universe without having any asymmetry between particles and anti-particles at the beginning. The d…. question will keep bothering me for a while; at least, until I find out if Pentaquarks were made in surplus of Anti-Pentaquarks. But that would only depend of the ratio of "colliding" elementary particles; so how on Earth can I find that? Bof! You can't win them all; can't you? This mystery has bothered me for decades. I think I finally understand it. Experience's results tell us that electron are produced by colliding gamma rays. And since gamma rays are the most energetic rays, we can assume that they were the first rays to appear in our universe. They would, then, be the origin of electrons. 1)-"expanding space" with still projected neutrinos (towards everywhere kinetic energy) and "added"
2) "inflating space" with decaying quarks (toward a center point oriented kinetic energy) that has become, today, stopped "inflated space". So let’s have another look at the electron production. Since gamma-rays are exclusively up and down motion, traveling at light-speed, when light-speed is blocked, all that is left are the up and down motions. And since an up motion cannot join with a down motion when the trajectory motion is stopped, they are side-tracked; one goes up, the other one goes down. So, what did actually happen? The logical question is: What can those up and down motions do when their trajectories are blocked, and they are side-tracked? The only thing I can imagine is that they each become a small quantum of energy and transform their up or down movements into rotating motions, one contrary to the other. One becomes negative (electron) while the other one becomes positive (positron). Those two quantum of energy become simply small “balls” of energy motion, rotating, and they both are projected away from each other because the energy of their blocked wave translation cannot just disappear. Their rotation gives them a minimal amount of mass energy which is not directed toward their center but is swirling around in a "blurred" volume with a non-defined center. This non-defined center makes them non-solid particles, a kind of ghost-like particles. Now we have to remember that the origin of those electrons is a gamma ray which is produced by neutrinos traveling at almost light speed. This fact means that they are not related to gluons. Which then means that they do not integrate a motion toward a center; meaning they don’t have a center of gravity. So they do have a bit of “mass energy” (confined kinetic energy) which defines a “density of energy” in the electromagnetism of the universe, but are, in reality, related to the “flat space” portion of the universe which attach them to the Universal time flow (neutrino flow). Their “energy density” has to be considered as a “pressure” just as the overall decreasing “pressure” of expanding energy on the basic space production “acceleration”. But the “pressure” of an electron is “confined” in a “blurred” volume of space. Furthermore, we can assume that the "density pressure" is related to electromagnetism. Which we will have to study a bit more carefully in a future post. In other words, Taus, Muons, and electrons (leptons) are particles related to “expansion space”, while quarks are particles related to “inflation space”. As for Bosons, being quanta of energy, they are simply related to the "kinetic energy" of our universe. Here is a drawing of an electron. You’ll agree that saying it is a cloud, is an excellent analogy. It is a “blurred” particle because it doesn’t have a defined center of gravity. But it has a bit of mass energy (pressure) since it is “confined kinetic energy”. Naturally, it’s the density of equilibrated energy inside that cloud, which decides whether the quanta of energy is a Tau, a Muon or an electron. And we already know that energy "density" is related to "time flows". Now if we install the electrons on their corresponding Time flow, which is the Big bang’s on the next drawing, we finally can “see” the superposition of different particles “Time flows” situating universe's both spaces composition: the "expanding space" versus "inflation space". It would be fun to compare the status of electrons related to the Big bang's time flow with the "flavor" characteristic of the "weak force", and the quarks related to the "Gluon's time flow" with the "color" characteristic of the "strong force". But I don't believe in forces so I won't loose time on it. And we can also assume that we will find “free electrons” in “expanding space”. I think that we are getting quite an improved "overall" comprehension of our universe to what is actually available; don't you? Looking back at my last drawing, I just realized that electrons, being on the Universal Time flow, it becomes inevitable that they are always joined (or coupled) with neutrinos which are the "expression" of that flow (I should have draw neutrinos on the same red flows as electrons). And it is just as normal that the neutrino adopts the characteristic of the electron, muon or tau involved. In fact, it doesn't "adopt" anything; it always depends of the environment's energy density. In other words, it follows the Time factor. Taus, muons and electrons don't "live" at the same epoch (density). I'll continue to scrutinize that drawing for a while. I don't know if this post will clear things more, but we have to go through it anyway. 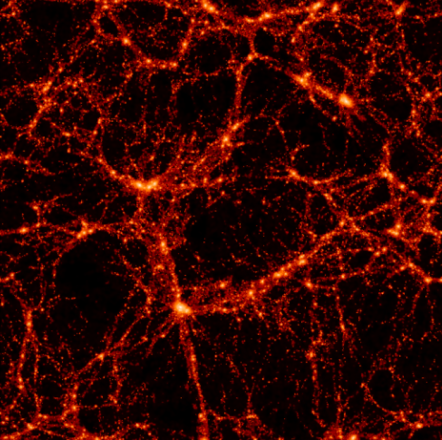 -The duplication of the primary space metrics characterizes the expansion of the universe. -This expansion of the universe accelerates because of the gradual diluting energy density in the environment; which decelerates the flow of the Universal Time. This happens because speed has a limit which is light speed. Because, we have to ask ourselves if dilution of energy in the overall universe, is an “effective” asset to the expansion of the universe since, simple increase of basic metrics duplication is quite enough to explain this acceleration. 1) Energy provokes the basic metrics to duplicate. So energy should be the real cause of existing space in which it dilutes. 2) Or, energy simply dilutes along the Time flow trajectory. So, then, energy would solely be the cause for Time’s expression. Number 1) isn’t acceptable anymore, since energy started producing “Time” BEFORE space appeared. So the energy’s “effect” is on the "Time flow" and not on the “space production”. Which eliminates no 1) as a diluting factor and supports no 2). We know that the result (the “work”) of energy is “motion”. The first motion ever produced was a “Time motion” (before even space appeared) rather than a “space motion”. In fact, space itself doesn’t have any “proper motion” because the overall space is the result of duplication of its basic metric (in this sense we join the scientists who say that “expansion” isn’t a “motion”). Which “basic metric” is produced by the “total energy’s motion” (light speed) applied to a “Time length” of 10^-43 sec, which simply becomes the “birth date” of “space”, and of the "present state" of Time itself. Which would mean that before the Big bang, Time increased speed until reaching "light speed" that "froze" it in a "present state". The fact is that basic “Time” is uni-dimensional; which means that it doesn’t have any “length”. So the notion of “Time length” relates exclusively to the “space basic metric” and not to “Time” itself; since the real nature of Time is “spaceless nor distenceless”. This would mean that the energy’s dilution is not related to “space production” but to uni-dimensional Time diffusion, meaning “Time flow”. So dilution of energy is related to “Time flow” and not at all to “space expansion”. This “fact” would explain that energy density differs at different “moments” on the Time flow, while being equilibrated at each of those different “moments”, in the overall space of the universe. Then the density of energy, when related to “motion”, becomes a “Time factor” instead of a “space factor”. And this confirms that “gravitation” is related to the “Time factor” as well, since density augments as you approach, on its “Time flow”, the “birth date” of an “event”. All this tells us that to understand “energy”, we have to consider it on the “time factor” rather than on the “space factor”. 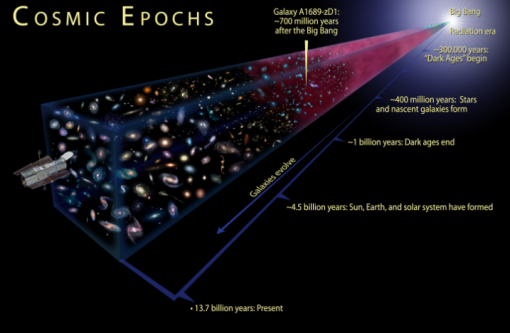 Finally, all the “dynamic” of the universe is concentrated in the “Time flows”. So we must now understand how all this relates to space? The answer is that the “Universal Time flow” doesn’t relate to space in any way, because the Universal Time flow is manifested at light speed; which means that it belongs to a constant “present state” of the universe (to which, energy wise, belongs the photon). The “past” itself appeared strictly when “less than light speed” was manifested. And we have dated this moment at 10^-43 sec after Time = Zero. This event resulted in the “appearance” of “space” which, then, started its personal “Time flow”. So now, what we have is a “no length” Time flow manifested before the Big bang, and a “basic length” Time flow afterward. It is important to “grasp” that this last Time flow is related to Universal “space-time” and not to Universal Time itself. Once more we have to “see” a difference between “space” and “Time”. And then, appeared “mass energy” (produced by gluons) that blocked the “flowing of time” at a certain “moment”, giving a “birth date” to this “blocked moment”, when its personal “time” started “flowing”. All those “birth dates” appeared at certain moments on the “Time arrow” which, all, started different “Time flows”. And each “birth date” was related to a specific event, whether it was a “phase transition”, a quantum of energy or a “mass energy volume”. Unfortunately, scientists don’t agree on “Time’s existence”; or at least, don't consider its importance. I’ve amused myself in drawing a chronological overall view of the results we know about the decaying process. I had a few surprises. As you see, I’ve differentiate neutrinos, gluons, bosons, Gamma rays, electrons and quarks particle from each other; because, in my mind, quite a few of them, in fact all of them beside quarks, aren’t even “particles”. Some can be considered as “pre-particles” even though they’ll never become particles and remain "fields". In my field notion, only the gluon field contains "particles". Photons and electrons are electromagnetic and kinetic fields respectively. Neutrinos are basic space metric components fields. 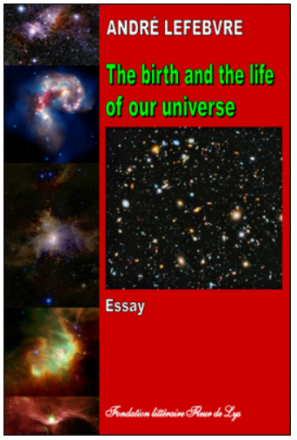 These descriptions can easily be understood by those who read my book "The birth and the life of our universe". We know that the “strangeness” of a Strange quark is that it cannot decay due to the strong force, meaning “gravitation” in my option, or electromagnetic force, still “gravitation” in my option. They decay by “weak force”. Which means that, since the weak force is imaginary, they decay as everything else does, by adapting to their density environment; and that explanation makes disappear their “strangeness”. I have to insist on the "fact" that nothing "strange" occurs in the universe; whatever "strangeness" we find, has to be in our "understanding" of events; simply because whatever happens in the universe is, indisputably, "normal", "logical" and "natural". Besides the strange quark production process that we see in the drawing, Strange quarks are also produced by “gluon fusion” (collision) which results in one Strange + one anti-Strange quarks. This “gluon fusion” process occurs 10 times faster than the quark process; which is, once again, quite normal since gluons move at light speed and quarks don’t. The important factor here would be to define the “ratio” of events. Note that Strange quarks can also bind with the heavier charm and bottom quarks which also like to bind with each other (which, again, is normal since they have bigger “deformed” time volumes (gravitation). Thus, in the presence of a large number of these quarks (at a certain epoch), quite unusually abundant exotic particles can be produced; some of these have never been observed yet in experiments. As we’ve already seen, there’s a possibility that “matter components” were “secured” this way from annihilation. The, undefined yet, asymmetry would then be at the exotic particles level. Which possibility, must I say, does become "logical" and "natural". A lot of things can be seen by this overall view of the decay process. One of them is the “fact” that Down quarks are issued through the anti-Top quarks decay chronology. This seems to show another discrepancy in the "overall" picture. A question arises also regarding the Gamma ray observed here, since it is sometimes replaced by the appearance of a Z boson. This known fact brings the following question: Which one of those "possible" fields decays into an electron/positron couple or a Charm/AntiCharm couple? This relation should be clarified. Researches are being done actually on the Z boson, without comparing to Gamma rays though. It would seem to me that the Z boson, just as do the W bosons, should transforms into a "particle" while gamma rays issues strictly in "fields". But I can't explain the process for now. On the other hand, this would suggest that even if the Z boson is being related to the electromagnetic photon, it could be previously linked to the gluon. Specially since the Z boson isn't involved in the absorption or emission of electrons and positrons "fields" like the W bosons are. How can a W+ boson become a Bottom quark particle that decays into an Up and AntiDown "particles", while the W- boson decays into an AntiBottom particle which decays into a neutrino and a positron "fields"? Isn’t this a break in “symmetry”? And if I add what we've just seen about the Z boson, it comes out that the + and zero electric charges are related to "particles" while the - (minus) relates to "fields". This is another "path" to follow. Another intuition comes up when I look at this drawing: Up and Down quarks seem to issue mainly from the Strange – AntiStrange quarks. I’ll put more attention to this; it could lead to something. After taking 7 hours to prepare this post, I guess I'm getting tired; so I'll stop for now. The “funny” Bottom quark decay. 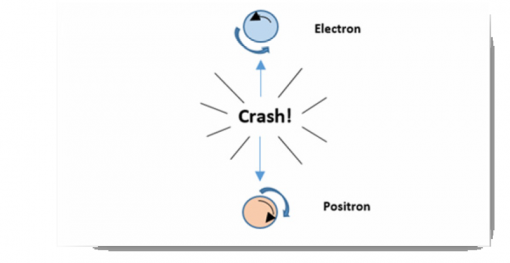 After a collision, a Bottom quark becomes a “messy” object. It surrounds itself with one anti-quark and a lot of other quarks, anti-quarks and gluons. The “messy” part is called a Bottom hadron. It might be a “B meson” or a “B baryon”; the latter is like a proton or neutron but with one down quark replaced with a Bottom quark. Inside this “messy” part, occurs many mini-collisions of mostly quark-quark and quark-gluon; while quark-antiquark collisions are relatively rare. Why? We don’t know; but the reason could probably answer the asymmetry problem. After traveling some distance, the Bottom quark decays into a Charm quark and a W+ boson. 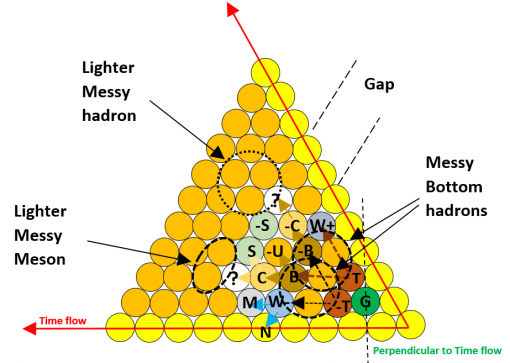 And the “messy” Bottom hadron fragments into many lighter hadrons. Let’s note that, as we saw, a Bottom hadron can be a B meson or a B baryon. In theory, both B mesons and B baryons should have approximately the same lifetime. But the fact is that all previous experiments measured a systematically shorter lifetime for B baryons than for B mesons. In other words, B mesons were more “stable”; or, as I see it, B baryons had more “urge” to adapt to their environment. 20 years of adjusting measures finally equalized (almost) the lifetimes and saved the theory. The funny part is that the “messy” Bottom hadron doesn’t decay at the same moment, or same place, as the Bottom quark. The hadrons in most jets (drawing at the left) will all originate at the collision point. But in a jet from a Bottom quark (at the right) the “messy” Bottom hadron will travel farther away before it starts to decay. After producing a Charm quark and a W+ boson, the rest of the “messy” part keeps on going further before decaying. 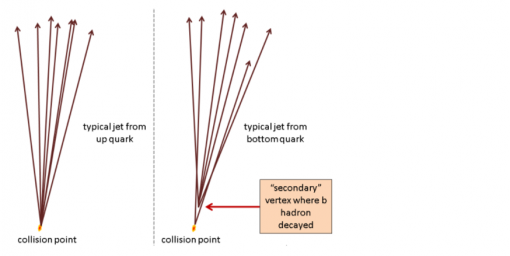 As you can see on the right drawing, a significant number of the hadrons in this jet came, not from the collision point, but from a point further out where the Bottom hadron decayed. So it’s evident that the Bottom quark adapts to it environment faster than the “messy” Bottom hadron. The question is: Why? Up until today, there is no explanation yet for the “gap” between the collision point and the “messy hadron decay point. So we'll have to check all this with what we have found ourselves. 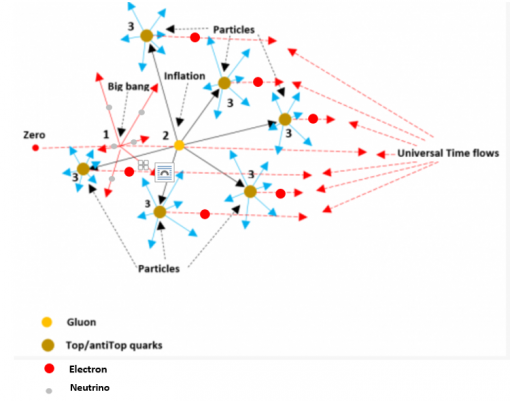 The Bottom quark stands in a space volume, and it has its proper “Time flow”. And it’s evident that whatever hadrons come out of the decay, they have to occupy space just as much. As we know hadrons are “composed particles”; which means that it has at least two quarks. And we can clearly see on the drawing that the first “space” available to contain two quarks are the two red circles which are part of the secondary “Time flow” of the initial center of the “messy” Bottom hadron occupied by the Bottom quark. And those two circles are quite far away leaving a “gap” from the Bottom quark. The two green circles in front of the Bottom quark represent its immediate decay into a Charm quark and a W+ boson. This would explain the “gap” between the Bottom quark and the decay of its “surrounding” hadron. You don’t get that kind of “gap” with other particles because they don’t “surround” themselves “messily” when decaying. And this more precise drawing gives a lot more explanations. 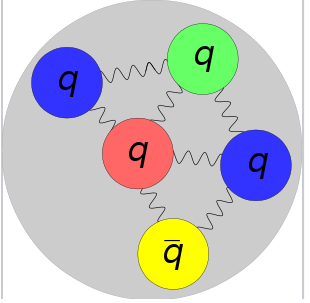 The green circle is the starting gluon that separates in two surfaces which become a Top and an antiTop quarks. Let’s first follow the antiTop. It decays into an antiBottom (follow its Time flow) and a W- Boson. Note that the W- Boson is slightly farther away than the quark from the starting center; so the energy density of its space environment is more diluted giving it less mass than the quark (remember that the Gluons installed themselves perpendicular to neutrinos which means "Time flow"). This W- Boson decays into a Muon and a Neutrino. What is not shown here, is that this last pair will acquire energy from the Universal Time flow (in yellow) through the produced Neutrino, and make, in the 3D volume, a Bottom quark with the Muon while the re-stabilized neutrino joins the Universal Time flow. Now let’s see the Top quark. It decays into a Bottom quark and a W+ Boson. This W+ Boson will transform (not shown here) into a Bottom quark (by what process?) which will decay into an Up and AntiDown quarks. The Bottom quark will decay right away in a Charm and an AntiUp quarks. The “messy” Bottom hadron won’t decay at the same moment. When it does, the Charm transforms in a Strange quark. 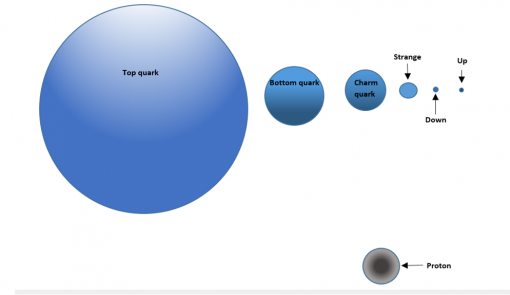 If you follow the Bottom quark decay, it produces a Charm quark and “something else” I don’t know about and couldn’t find in experiment results. But we see clearly that this “something else” prevents the “Messy” Bottom hadron to produce a lighter hadron because there’s only space enough left for two particles; which become a Meson. We can see that this is not the case for the antiBottom decay process. Furthermore, the “Messy” characteristic seems to be caused by the “overlapping” of the Top/antiTop environment; and we still have our “gap” between the “moments” of their decay. There also seem to exist an even smaller "gap" between Top and Bottom quarks decays. Could this be a "prediction" or is it an error in the space metric production representation? 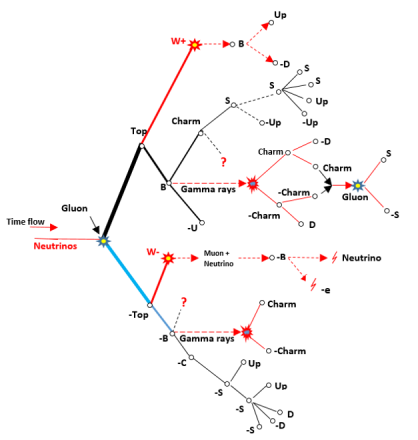 If there's no "gap", the Bottom quark goes beside the Top quark with the W+ Boson at the top, and the antiBottom quark goes beside the antiTop quark while the W- Boson decays, in the 3D portion of space not shown, in a Muon (electronic in the Time flow) and a Neutrino. This last possibility seems more accurate to me. There are probably more information here that I didn't "see" yet. Let’s see more precisely the Top decay process. 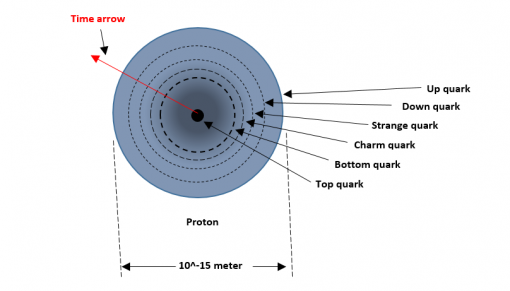 As I’ve suggested in my last post, let’s eliminate the “gap” between the Top quark and Bottom quark and look at what comes out of it; maybe we will find the process that we were asking about. Note that there are “electronic particles”, not shown here, produced in these decays. For example: Bottom quark (least mass 4 Gev) produces a Charm quark (least mass 1 Gev) + AntiUp quark (least mass 1, 5 Gev) which leaves 1, 5 GeV of mass energy, but could be more or less depending which particles are more massive. This would mean that some “mass energy” could be transformed into electronic particles (Tau 1,777GeV, Muon 105, 66 MeV, or Electron 511 MeV). This "mass energy" can also transform into kinetic energy releasing Neutrinos. Those electronic particles have specific “mass energy” while the previous produced particles have variable “mass energy”. Why? Probably because there is a margin where particles can stay “stable” (in equilibrium with its environment), which permits them to “resist” decaying. During that small “period”, other similar particles appear having less “mass energy” because the energy density doesn't stop diluting. On the other hand, it’s obvious that this “remain” of “mass energy” composes what is called the “Messy Bottom hadron” surrounding the Bottom quark. For example a Charm quark has 1, 15 GeV of “mass energy” which still leaves 350 MeV for a Strange quark or two, even three (80 to 130 MeV each). As for the AntiBottom quark, it produces an AntiCharm quark and an “unknown particle” that can use around 2, 8 GeV of mass energy; which is quite enough to represent the “messy Bottom hadron” around an AntiBottom quark if this “mess” is also observed in its decay; if not, we have a most interesting problem. On the other hand, something different happens in our Top quark decay. Since the “mass energy” of particles are defined by their “birth dates”, and since we know that a “particle” was observed at 125 GeV, this particle has to be produced between the Top quark and the advent of the Bottom quark. That particle, which was called the Higgs Boson, is represented here as the “rosy” particle coming from the Top quark. Its “birth date”, perpendicular to the Universal Time flow, corresponding to its “mass energy” of 125 GeV. Mind you, it could always come from the electromagnetic energy of the universe (W and Z Bosons). 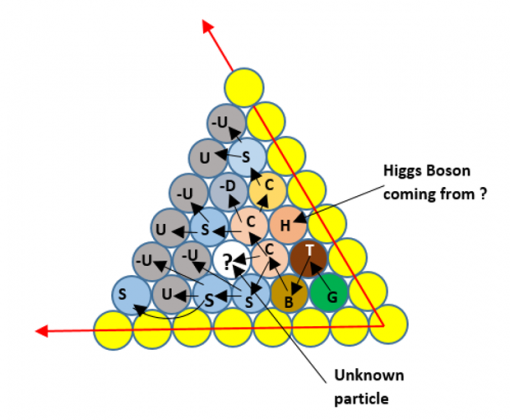 So if that Higgs Boson comes from the Top quark, it would leave around 48 GeV of mass energy from the Top quark, not accounted for; quite more than enough to produce a Bottom quark and a "Messy Bottom hadron". What was observed in the Higgs decay was the production of two W Bosons (total = 160, 5 Gev), a Tau-AntiTau pair (= 3, 554 Gev), two Z Boson (= 182, 334 GeV), or Two Photons. These last two productions being massless quanta of electromagnetic energy (so kinetic energy) simply leave the “particle process” Time flow and join the "present state" of the Universe. Other particle pair productions are also predicted but not yet observed. The fact is that the Boson pair production sums to more than the mass energy of the Higgs particle; so the mass energy remain of 48 GeV has to be implicated in those Boson productions of the Higgs. 48 GeV is sufficient to produce the W Boson pair, but misses 9, 334 GeV to produce the observed Z boson pair; the question becomes: Where else can that missing “mass energy” come from to produce that Z Boson pair? The actual explanation of the Standard model involves “colour”, “Flavor”, “spin”, etc. but none of those characteristics can ever justify the “missing mass energy” to produce a particle. We still do not “master” explicitly the particle production process; and if we do, it’s not well explained. So this is what I have to work with. At first glance we have a surplus of AntiDown and AntiUp quarks. So there has to be missing productions? I’ll have to re-check; but right now, I’m tired. We will start considering the whole universe as a field composed of, or more accurately, containing other fields. But our fields will be a lot easier to describe than the Quantum theory fields, even though they are the same. So let’s define our fields. The following drawing is a “field”; which means a space “surface” defined as different from the surrounding surface. It is a gray surface on a white surface. It could represent a “Baseball field”, a “Football field”, a “grazing field” or whatever portion of surface that is designated from the rest of a surface. This next drawing is also a field; but it is a space “volume”, different from its surrounding space. It could be the volume of a ball, a house etc. It’s whatever “volume” however defined from its 3D surrounding. From this definition we can say that the existing universe is a “field” defined, by its “existence”, from its “non-existing surroundings”. Which make the universe infinite (all that exist) while having a definite volume. And since everything that exists is “energy”, we can also say that the universe is defined, by its energy, from its non-energical surrounding. The energy of the universe is what makes it “dynamic”; and its dynamism is expressed by its expansion. No other energy than “kinetic-energy” can express itself this way; because expansion is a “motion” towards everywhere, from everywhere. Presented this way, we understand that the universe is a “kinetic-energy field” that expands into a “non-energetic field”. In this regard, expansion is simply a “creation” of space by the “motion” issued from the "Universal kinetic-energy field". And the same "field notion" applies in physics, where fields become “volumes” different from their surroundings. For example, a quark is an “energy field” different from its surrounding energy. So in order to identify quarks energy from its surrounding energy, since they have “mass”, we will say that a quark is a “mass-energy field”. Whatever the field considered, it has “borders”; otherwise it couldn’t be differentiated from its environment. So quarks have “borders”, which means that their “mass-energy” characteristic is limited to a certain “volume”. This also means that its energy doesn’t spread “infinitely” contrary to the “kinetic-energy field” called the Universe. “Kinetic-energy fields” are different than “mass-energy fields”; otherwise we couldn’t differentiate quarks from its universal environment. But both “kinetic” and “mass” are energies; so what difference could they have toward one another? We can find the answer by analysing a Proton which, also, has “mass-energy”. The mass-energy of a Proton is composed of 1% of its quarks mass-energy and 99% of its “inner” kinetic-energy. So if 99% of the Proton’s “mass energy” is “kinetic-energy”, we can surmise that the quarks mass-energy is also kinetic-energy. But if they are both kinetic-energy, then how can their fields be differentiated from one another? The difference between a “Proton field” and the “Universe field” is that the Universe field doesn’t have a center while the Proton field has one. The universe doesn’t have a center because the motion produced by its kinetic-energy is oriented from everywhere, towards everywhere; which makes it impossible to define a center of origin. This means that, if a center is defined inside a proton, it as to be because of a difference in orientation. In fact, the “inner” motion of “mass-energy” is always oriented from everywhere, inside the proton, towards its center. This is why it is called: a center of gravity; which, definitely, relates “gravitation” to “mass-energy”. So the only difference possible between “kinetic” and “mass” energy has to be the “motion” orientation. “Kinetic-energy” is oriented towards “everywhere”, while “mass-energy” is oriented toward “a definite center point”. And the field’s volume is defined where these orientations differs. Mass-energy is what defines the center of gravity because it is oriented towards it. Being energy, when it reaches that center of gravity, it has to “act” upon it, and there has to be a consequence to its “action”. Einstein already gave us the answer to this question in is definition of gravitation: “Gravitation is a consequence of a space-time deformation”. And since a “space-time deformation” has to have a “volume”, we can say that a “gravitational field” is a defined “deformed space-time volume” consequent to the “action” of “mass-energy” on its defined center of gravity. This way, we just have designed “all mass-energy fields” as being “gravitational fields”. Which means that all massive fundamental particles that have defined centers, are "gravitational fields”. Now we have to verify, just in case, if there wouldn’t be any fundamental “mass-energy fields” that do not have a defined center, keeping them from being "gravitational fields". Gluons and Photons don’t have mass; but they are quanta of energy. Neutrinos seem to have mass but where’re not sure since we cannot quantify it exactly; they also are quanta of energy. Electrons have a bit of mass; but an electron is a “blurred” particle; which means that its center is not defined. This means that its “mass-energy” is not oriented toward a defined center; but its “motion” is limited to a “blurred space-time volume” or a "blurred mass-energy field". Muons and Taus are the same particles as electrons but have more mass-energy. So they are just as “blurred mass-energy fields” without defined centers. These three particles are, then, “mass-energy fields” without being “gravitational fields”. Electrons don’t “merge” to one another since they cannot “unify” their “non-defined centers”. Quarks are defined volumes; which means that they possess a define center of gravity. So quarks are “gravitational fields”. Finally, the “Universal field” is a “kinetic-energy field” containing “mass-energy fields” and “gravitational fields”. But what about the quanta of energies? What are they exactly? For a start, we know that a Photon is a quantum of "electromagnetic energy". But what is that new kind of energy we didn’t meet yet? Electromagnetism is the result of the junction of a “repellent field” to an “attracting field” perpendicular to each other. So before the “junction” occurred, each fields where separated. Now, which fundamental fields do we know, that possesses those two characteristics? The “repellent field” is related to the motion towards everywhere, and the “attracting field” is related to the motion toward a defined point. The “toward everywhere” quantum of energy is the Neutrino; it doesn’t interact with anything. Which leaves us with the “toward a defined center” quantum of energy as being the Gluon; it “glues” things together. So Electromagnetism becomes the junction of “Neutrino fields” to “Gluon fields”; in other words, Electromagnetism is the junction of a “kinetic-energy field” to a “mass-energy field”. Which is a far more precise description than saying it is a “force” that comes out from nowhere. 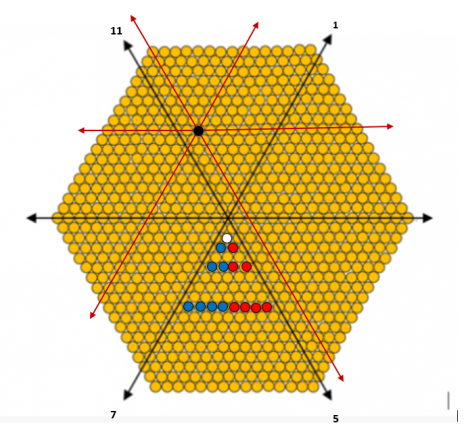 So we have designed all existing fields composing the “Universal field”. Furthermore, this field description shows the simplicity of the nature of everything that composes our universe, which has the same nature as space-time itself, meaning: “Kinetic-energy”. We, then, have to accept that the basic component of everything is “Kinetic-energy”; which, we know, never disappears but can transform itself into other kinds of energy depending of the environment conditions. The main environment condition of the "Universal field" is its continuous decreasing energy density because of its expansion. Don’t you feel we aren’t very far from a “Unified theory of everything”? I must admit that I do. In fact, if you let those different "fields" do what they are able to, you end up with what we observe today. Mind you, I don't use the "field notion" in the book. You'll have to adjust that notion to explanations. In reality, it had to duplicate itself since it couldn’t “grow” by half of its size, which is an impossible distance to exist. # 2- The gluon appeared at 10^-36 sec, perpendicular to the "radiance" of the universe, making it electromagnetic and starts "inflation". The universal diameter had previously expanded to 10^-15 meter. # 3- “Expansion-energy”, in fact kinetic-energy, separates the gluon’s front from its back surface; which both, started spinning each defining its “field of influence”. # 4- Spinning Front and back surfaces of gluon define an “active field” then both recoil, each confining their “proper” energy, which produces massive Top quark particles. That is the first moment for significant manifestation of the inflation period. From this point on, nothing else happens with the overall expanding “universal field”, with one exception: the advent of electronic “pre-particles”. Everything else that follows, occurs inside the “active fields” of all Gluons, floating in the “universal field”, in accordance with the decay process we already saw. The results are gradual less dense “fields” incorporated one inside the others according to their “birth” dates and the continually environment decreasing density of "universal energy". Meanwhile occurs the exception I was talking about: "Electromagnetic-energy-rays" (waves), issued from around Bottom quarks, collide to produce electronic particles (Taus-Muons-Electrons) that spreads everywhere in the electromagnetic “universal field”. Those particles don’t have centers of gravity even if they have small “mass-energy”; in fact, it is not exactly “mass-energy”; we can more precisely consider their “mass” as the “weight” of their confined “spinning kinetic-energy” volume (field). This "weight" would be the difference between their velocity and the velocity of the "universal radiance field". Decays of quarks also release either kinetic-energy (Neutrinos), mass-energy (W & Z Bosons) or electromagnetic-energy (Photons) quanta. They are quanta of energy (energy eruptions/bursts) different than massive particles because they, also, do not possess a center of gravity. 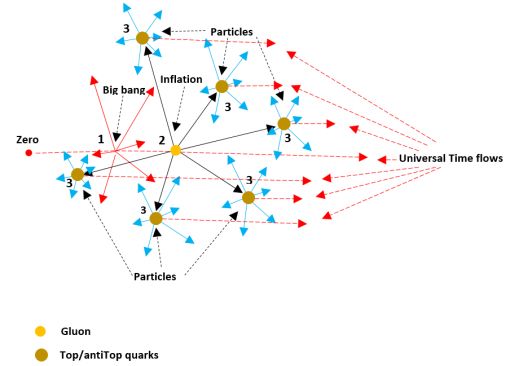 When, finally, Up and Down quarks appear, inflation stops. The “instant” on the “Time flow” is 10^-32 sec after the start of the “Time flow” at 0 sec (beginning of Planck’s epoch). Starting from the appearance of the Bottom quark and its antiparticle, gravitational fields of massive particles provoke all events happening along the “Time flow”, while particles try to equilibrate with the continually decreasing energy density of the expanding “Universal field”. 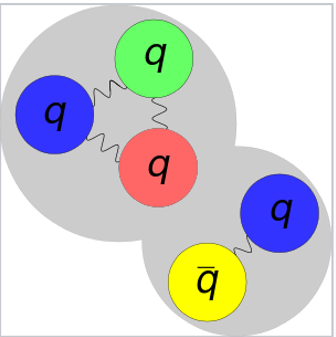 The equilibrium is attained, by Up and Down quarks, after trying all combination possibilities (mesons and exotic particles), by uniting in group of three joining their centers of gravity into one. This equilibrium situation results in the appearance of “matter” particles in the “universal field”. They are called Protons and Neutrons. Both of those composite particles inherits an extended “gravitational field” from the accumulating “effect” of the “gravitational fields” junction of their components. This extended “gravitational field” will, then, capture a low massive “blurred” electron floating in the “universal field” which mass-energy (confined spinning kinetic energy) will “disperse” throughout the “gravitational field”, because the electron doesn’t have a center of gravity to fix itself at the proton’s center of gravity. The "dispersion" of the electron's energy through the "gravitational field" will define the energy density of the electronic shell. With the new electron component, the proton’s “gravitational field” becomes an “element” called Hydrogen. 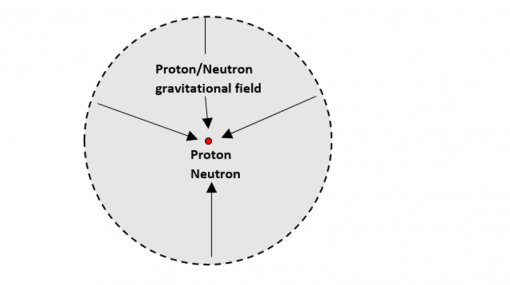 Into which “gravitational field”, one or two neutrons can “fall” to the center where the proton stands. This accretion of neutrons produces two “isotopes”: one added neutron makes a Deuterium, while two added neutrons results in a Tritium. These two “isotopes” represent the transition phases between the Hydrogen element and later produced elements. But, even if Hydrogen exists at this “moment” on the “Time flow”, stars cannot start being “created” by “accretion of Hydrogen yet; they will have to wait until Helium and even Lithium appears. I will explain the reason soon, I hope. Instead of trying to find if anybody ever solved the problem decades ago, let’s use our brain a bit and proceed with the actual physics and chemical knowledge we have. And one knowledge we mustn’t forget is that a “gravitational effect” is not a “pulling effect”; it’s a “falling effect”. First of all, stars are produced by “accretion” of particles, mainly hydrogen. The problem is that the “accretion process” must be continuous; and to be continuous, the “gravitational effect” in the “field” surrounding the “accreted particles” has to augment continuously. Otherwise “accretion” stops, since “accretion” is a result of the “gravitational effect”. So if you start with two “accreting” hydrogen atoms, this will create a “molecule” by covalence; and “covalence”, at the border of atoms, doesn’t augment the “gravitational effect” of the “field” produced, because the particles do not join centers of gravity. Which means that there’s no “accretion”. 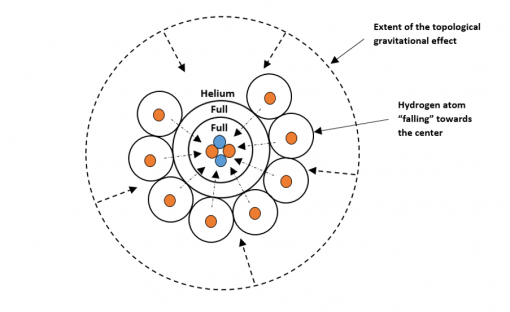 So in order to have an augmented gravitational effect of the overall “field”, you have to start with an helium atom that has a “full” valence shell, and four times more “mass-energy” than hydrogen. The helium atom can, then, “capture” hydrogen atoms in its “field” without giving them the “covalence” opportunity. The result is that each centers of gravity of each hydrogen atoms merge with the helium’s center of gravity increasing automatically the “gravitational effect” around the “accreted particles”. As you can see there’s no “magical” force needed to obtain that result; gravitational “effect” is quite enough. This increased volume of “gravitational effect” captures even more hydrogen atoms that “falls” toward the center of gravity, still increasing the “gravitational effect”, but now, also starts to increase “pressure” on the helium core and the first row of hydrogen atoms surrounding it; of which the energy density of their valence shell is increased by the pressure, and prevents “covalence” with the arriving hydrogen atoms; which also, join their center of gravity to the “bulk’s” center of gravity. Gradually and continuously, hydrogen atoms accrete to the growing “bulk” of hydrogen, increasing progressively the “gravitational effect” of the overall “field” and the “pressure” produced by “falling” atoms towards the center of gravity. When enough massive hydrogen atoms “accrete”, the “falling process” pressure becomes sufficient to provoke fusion at the center of gravity and a star is born. Official Dark matter clumping and Galaxy birth. Let’s see the latest official information. Dan Marrone, an associate professor of astronomy at the University of Arizona in Tucson and lead author of the new paper, said in a statement: “With these exquisite ALMA observations, astronomers are seeing the most massive galaxy known in the first billion years of the universe in the process of assembling itself," (See: By Hanneke Weitering, Space.com Staff Writer | December 7, 2017 06:31am ET). This was when the universe was only 780 million years old, at an epoch called “reionization” where “space was saturated with an opaque fog of cold hydrogen gas”. In fact, here, “cold” doesn’t really mean as “cold” as it sounds; it means “less hot than previously”; because the energy density in space had been decreasing since the beginning and was still decreasing because of continual expansion. Consequently, the "foggy" situation was quite “normal” since space was saturated with denser than today hydrogen gas; so space was occupied by a “fog” of hydrogen gas. But again, this cannot be an exact description of “space” at that epoch. Because ever since 380,000 years after Bb, the “space” of the universe was composed of small “hot focusing” and small “colder dispersing” volumes as we “see” it on MWB photos. So the “reality” becomes that some portions of “space of that epoch” was saturated with hydrogen gas, forming portions of “foggy volumes”, while other “portions” of space was a lot less dense or, if you prefer: a lot less “foggy”. There can be no arguments against this fact. And, quite naturally, it is in those hydrogen “foggy volumes” that stars started to form by “accretion”. Dan Marrone continues saying: “Mounting observational evidence with ALMA, however, has helped to reshape that story and continues to push back the time at which truly massive galaxies first emerged in the universe." So after mentioning “volumes of hydrogen” where we saw stars started to form, Mr. Marrone jumps to the formation of “galaxies”. Even for one single lonely neuron, it’s pretty evident that the galaxies where, at that epoch, already present as “foggy volumes of hydrogen”; so those hydrogen volumes are exactly what he is talking about: Galaxies. And they had not “emerge” in the universe; they had been gravitationally forming since the beginning of “matter” particles even before the MWB photos. 1)	A volume of dense hydrogen gas doesn’t need “dark matter” to produce stars”. The center of gravity of the “gas volume” is enough to provoke “accretion” of hydrogen atoms by simply "falling" at the center of that volume. Which becomes, then, the center of a “galaxy”. 2)	Furthermore, inside those “foggy hydrogen clouds”, we know that are present “helium atoms” which possess 4 times more voluminous “gravitational fields” than hydrogen, that can “accrete” hydrogen atoms keeping them from producing “molecules”; because helium and hydrogen cannot “covalence”. Which is a basic condition permitting those helium atoms to accumulate "pressure" able to “create stars” (this might even eliminate the need for the reionization period because stars don't need any magical electromagnetic "force" to be formed). 3)	Since that the “gravitational field’s” (containing the “galactically” assemble fog of hydrogen) accretion process at its center point of gravity will accumulate hydrogen atoms far faster than any helium atoms (elsewhere in the cloud), the result will be that a “black hole” will appear quite rapidly at the center of that “galaxy” without preventing stars to continue forming elsewhere in that galaxy with an helium atom at their centers, also helped by naturally Lagrangian points formations. 4)	As for “Galaxies being born inside halos of dark matter”, that is pure fiction; because there’s no “explanation”, whatsoever, justifying the existence of those “dark matter halos”, since all matter particles accumulation where produced by a successive decaying process, constantly occurring “inside a gluon field”; which "field" is a quite sufficient explanation to supply a “halo” containing a galaxy. To sum up, this article proceeds in introducing “non-explainable”, “not discernable”, and “not needed”, dark matter inside the formation of stars and galaxies without any objectivity; and that is really exasperating. Furthermore, we can start thinking that whatever observation of "halos" around a galaxy could simply be a "deformed volume of space-time" instead of a "dark matter volume". And when two clusters of galaxies collide, those "halos" could be disturbed quite a bit. This is just a suggestion; but a "meaningful" suggestion. The blue portions of the photo no 2 represent “colder” space while the reddish parts no 3 are “hotter”. The explanation of the difference in temperature is simply the “motion” we can see in both photos of spaces. Where space is colder (blue), we see a “dispersing motion”, while were space is “hot” (reddish) we find a “focusing motion”. In other words, where space is “hot” we have a “gravitational effect” while were it is “cold”, we see “expanding space”. So if you go back to the first photo (no 1), you may see very large reddish portions of space that tends “focusing”; which means “passively falling” toward a “denser region”, while blue portions are "actively expanding" in all directions, diluting density. This also means that the “gravitational effect”, equally important as the “expanding action”, are the only two main seperate events of that period. It is evident that the reddish parts contains more “matter” that the blue parts; and at the time, “matter” was limited to hydrogen and helium. Because stars hadn’t form yet to produce heavier atoms. So when we were talking of “hydrogen fog”, in my previous post, where we said that the first stars formed, we were, in fact, talking about those “reddish” portions of the MWB photo. And to understand the formation of galaxies, we evidently have to cease considering that the universe of that epoch was “homogenous”; it wasn’t at all, as we can observe in the photo no 1. So, we have to admit that it isn’t the whole universe that was in a “foggy” space-time situation; only a portion of it was. And we now know that each of those “foggy” portions where “falling” inside themselves, while their surrounding was expanding. It’s easy to understand that those “falling” foggy portions, occupied by hydrogen and a bit of helium, is where we will find the future galaxies we can observe today. The question becomes: Are we able to “see” where those galaxies will form? The answer is: Yes we can! So let’s have a second look. 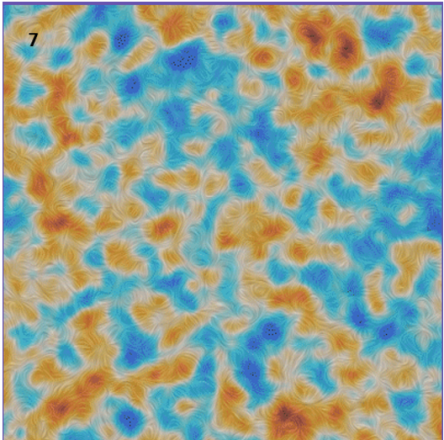 The picture on the left (4) shows the increasing density of the *falling” reddish portions and the decreasing density of the “expanding” blue portions. 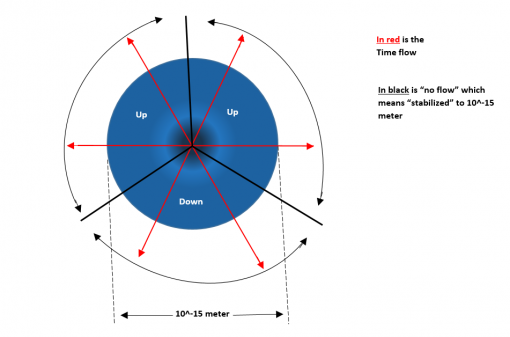 Which permits us to define the overall volume (black circle) falling toward the center of the gravitational effect (white arrows) applied to the “foggy reddish” space-time portion containing hydrogen and helium as shown in the no 5 picture. In the next picture (6) you can see the universal portion surface (white rectangle) represented by the preceding photo where, within this small surface, we have found at least two forming galaxies. But are they really future galaxies? Let’s verify a bit more. As we can see, inside the previous “reddish” foggy volumes of the photo no 5, we now discover still smaller blue expanding volumes between smaller “falling reddish” volumes. The only explanation in order to establish a relation between these photos and the future galaxies is to understand that this last photo (7) represents those future galaxies, while the previous one (5) represents future “clusters” of galaxies. I can’t see any complications in attaining the actual structure of our universe if we just simply let the “expanding” and “falling” “motions” do their “thing”. It has to end up with clusters of galaxies (no 5) containing galaxies separated by “expanding flat space-time” (no 7). If you have any objections, I’d like to know; please. Here is another work I was doing beside the previous post. And since they are related, I can’t wait to present it. Having just finished it, I had a surprise waiting for me at the end. -The “A” portion of the “Time flow” is the total life length of the universe with its actual energy density. -The “B” portion is half the age of the universe with twice its energy density. -The “C” portion represents a quarter of the life span of the universe, and has four times the actual energy density. -The “D” part is 1/8 of the actual duration of our universe, and possesses a density eight times greater than the actual energy density of the universe. -The “E” period represents 1/16 of our universe duration, and is animated by 16 times more dense energy than it is today. -Finally, the “F” period, that lasted around 430 million years, has an energy density 32 times superior to the actual energy density of the universe. I use the occasion to suggest that the "gravitational effect" at this period (or all others) results in the same "effect" observed today, since the energy density at each period is relative to the present energy density. Nevertheless, the idea is to continue, without any drawing, dividing periods by two, in order to conceptualize the progressing energy density of the universe. We will keep giving letters to identify the different periods. -Period “G” has lasted 215 million years and had a density 64 times greater than the actual density of the universe. -Period “H” is dated at 107, 5 million years after Bb, with an energy density 128 more intense than today. -Period “I” lasted 53, 75 million years with a density 256 more important than today’s universal energy density. -Period “J” is dated at 26, 875 million years and possess an energy density 516 more important than the energy density of our actual universe. -Period “K” dates to 13, 438 million years after the Big bang with an energy density of 1,032 times more intense than the actual energy density of the universe. -Period “L” ends 6, 719 million years after the big bang having decease its energy density to 2,064 times more important than today’s universal energy density. -Period “M” contains the first 3, 36 million years of our universe existence and has an energy density 4,128 times more important than today’s universal energy density. -Period “N” is the first million and 680 thousand years of the existence of our universe. It has an energy density of 8,256 times more concentrated than today. -Period “O” represents the first 840 thousand years of the universe which had a density 16,512 times more dominant than the actual universal energy density. -Period “P” lasted 420 thousand years after the Big bang and the universal energy of that epoch was 33 thousand times denser than the present energy density of our universe. This “P” period occurred a little later, in fact 40 thousand years after the photo we have seen of the Micro Wave Background in my preceding post, which is dated at 380,000 years after the Big bang. So, if ever you go back to read that previous post, you’ll have to keep in mind this 33 thousand times denser “energy density” in which the “active dispersing” and the “passive focusing” motions are occurring. New ideas might suddenly pop up in your mind. -Period “Q” persisted for 210 thousand years after the Big bang where Protons and Neutrons were surrounded by electromagnetic “waves” occurring through the whole universe. 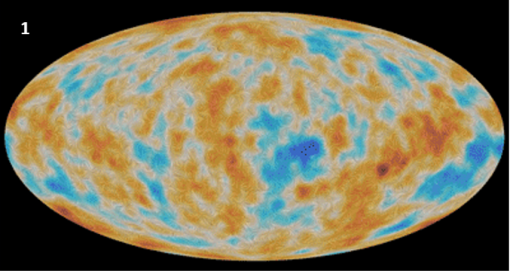 -Period “R” dates to 105 thousand years after the Big bang and scientists just had, in 2013, a glance at what the epoch looked like. “There appears to be an excess dash of radiation that is not due to CMB photons.” Says Eric Linder, a theoretical physicist at the Lawrence Berkeley National Laboratory. Linder suggests the reason behind these relativistic particles are early versions of neutrinos. Let’s come back to the first production of black holes. When and how could they have first been formed? And, since the “accretion” process is involved, the answer has to be found at the atomic level. At the atomic level, we know that a hydrogen atom possesses one single electron and can accept one more electron in its valence shell. But as we already saw, an electron is a blurred pre-particle. It’s not a “defined” particle; which means that it is a “volume” of spinning energy without any center of gravity. So when covalence occurs between two hydrogen atoms, it simply means that the energy density of the valence shell “fills” itself to its maximum density without the possibility of uniting any centers of gravity that don’t exist. Let’s see how that “looks” like, in “reality”. The linear geometry disposition, we see here, of covalence hydrogen is the result of energy “equilibrium” needed in the shells (in the particle notion, we would have two electrons installed opposite to each other in the shell) . Which suggest that this needed “equilibrium” might control the geometry of molecules. But since all those shells have mass-energy, how does that mass-energy handle itself in hydrogen gas? I mean, does the center of gravity of each protons unify in a mutual center of gravity even if energy shells don’t have a center of gravity? The answer is: they adopt a "barycenter"; which is the "equilibrium" point of "tidal effects" and is not a "real" center of gravity. And since two protons alone cannot produce a nuclei without the presence of a neutron, they "repel" each other (prevent uniting in a nuclei) diminishing the effectiveness of their "gravitational field"; which means that there’s no significant increase of “pressure” on the barycenter. This also explain the existence of large molecular hydrogen clouds that do not respond to a unique great collapsing process. So let’s start from the other end. Presently we think that stars form by “accreting” hydrogen atoms. But from the preceding drawing of “accreted” hydrogen, there’s no way that “pressure” can increase in the “valancing” process, since we can see that the pressure remains stable all along covalence atoms. So it becomes obvious that without increasing “pressure” a star has no possibility to ever “ignite”. The first stars had to be produced by “accretion” of what existed, and was available, at the time. And the only atoms available were hydrogen, less helium and even less lithium atoms. We just saw that accretion of hydrogen by the “valancing process” doesn’t increase “pressure”; so what happens with a helium atom that has 4 times more gravitational effect than hydrogen? 1-The dotted circle represents the volume of “gravitational effect” produced by the centered helium atom (it could also be a more massive Lithium atom, which would even have more efficiency). 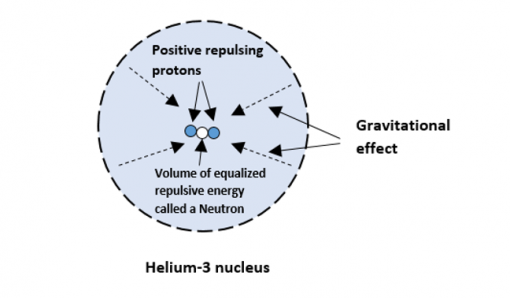 2-We can see that hydrogen atoms “fall” toward the center of gravity of the “gravitational field”, thus starting a “pressure” on the helium atom, because they cannot “interact” with the “full” valence shell of helium. Covalence of hydrogen atoms around a helium atom doesn’t change anything to the event, except “adding” proton mass-energy if they do covalence, leaving space for additional hydrogen atoms. So with this “accretion process” having a helium atom at the center, we are certain it produces “pressure”, thus a star which can become a Black hole according to our actual knowledge. Now regarding the formation of a black hole, I have a little problem. When a star collapses, it goes through what is called “limits” that can stop its collapsing process. Usually, when a star crosses one of those limits, it results in an explosion, projecting the matter present at the surface of the star, into space. So hypothetically, before attaining a black hole state, a star has to “explode” a few times. On the other hand, if the star projects matter in space, it loses “mass-energy”; which diminishes the “pressure” on the center of gravity. Diminishing the “pressure” on a center of gravity is not the most efficient way to encourage “collapsing”. But let’s say that the suggested process is exact and, that the star has enough “mass-energy” to keep collapsing after exploding. This means that it possesses more than needed “matter”, pushing towards the center of gravity, in order to be able to get rid of some of it. But if a star has so much “over-needed” mass-energy, I’m afraid that the mass-energy pressure would prevent any possibility of “outside projection”. In other words, the collapsing process towards a black hole, keeps on without any possible obstructive events from those “limits”. So when a collapsing star becomes a black hole, I don’t think that any “explosion” occurs in the process. In other words, when a star “explodes”, it results in the fact that its “collapsing process” is stopped; producing white dwarfs or neutron stars, for example. As for the “temperature” factor through the process, temperature is caused by “pressure” so is irrelevant. I could be wrong but I doubt it. Note: We’ve deducted that an electronic field’s (electron’s) “mass-energy” doesn’t possess a center of gravity, while the proton field’s mass-energy does. This makes the electron a “quasi-particle” while the proton is a “particle”. Question: What could determine the energy density of the first electronic shell’s atom? We could probably find the answer by analysing the “covalence” of two hydrogen atoms which possess only one shell each. Now this only explains the electronic energy “density” we should find between the protons of “covalence” hydrogen atoms shells. But what happens when a hydrogen atom becomes another element, by “accepting” a proton and an electron as for an helium 3 atom, for example? First: We know that there has to be “added” a neutron between the protons; otherwise a new element is impossible. 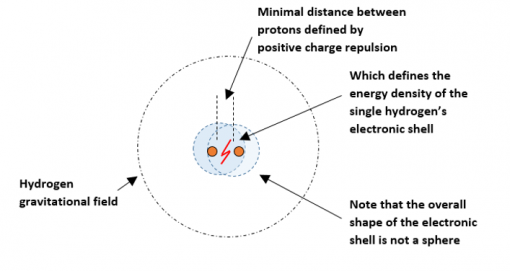 Proton cannot “touch” each other because of their positive electronic charge. But by what “event” can that necessity be explained? In other words, the real question becomes: Is a neutron a “chemical earlier necessity” or simply a “geometrical event result”? Remark: Both protons have the same positive charge “intensity”; so, normally, when they equalize their repulsive effect, it’s as if each proton is using “half” of its proper “intensity” against the other. And since their “full” power charge “intensity” defines their own “energetic volume” (their field), the repulsive result of both "half" energy densities should be a distance, between each protons, equal to each their own full “diameter”. Since we know that protons and neutrons have the same size, we’ve just discovered that a neutron is “created” when proton’s energy fields unite their center of gravity; in other words, the initial hadron is a proton; the neutron becomes only a “consequence” of joining proton’s “gravitational fields”. Which is perfectly logical since a “neutral” particle has to be an “equalized” particle; and “equilibrium” necessitates two “items” non-neutral already existing. And this simplifies a lot the initial nucleosynthesis since all that was existing at the time was exclusively electrons and protons. We don't have to "create" hardly explainable "unstable equalized charge" neutrons anymore. But then, what happens with quarks and their fractional electric charges? For now, I don’t see any problem to their existence at the condition that, in the “field optic”, we call electrons: “quasi-particles” (which is already accepted); quarks would be called: “pre-particles” (which, in fact, they are) and bosons called: “excitation” or “excited energy quanta” (which they are basically). These denominations would separate the "probability" phase from the "possibility" phase, in the universal evolution. The "possibility" phase would start only at the occurrence of "particles". Another question would be: Where, then, do “free” neutrons come from? They would simply be a result of radioactive decays and rare natural nuclear fission, which results in the release of free neutrons from atoms. Our explanation of their “creation” would explain why, even if they are “neutral”, in other words “equalized”, they still are “unstable”; which is not normal for an “equalized” particle. The most difficult question would be: If this proposition of the neutron’s “creation” is right, how can deuterium exists BEFORE helium? And I have no answer for now. I’ll have to think about it. And I didn’t even address the subject of this post. How shameful!!! I’ll certainly be back to you. I never thought there was such a problem, as I just found, with the Deuterium production during the Big Bang nucleosynthesis. Experiments say that the temperature was too important to permit Deuterium to stabilize. So it seems to have stabilized later than Helium. The discussions on the subject are still going. According to actual Standard Model description, two atoms of Deuterium would join to form one atom of Helium-4. But if a Neutron is formed by the presence of two protons in a nucleus, as we saw in the last post, this process for creating Helium-4 is impossible. In fact, Helium-3 would be the only first produced element after Hydrogen. And it would result from the joining of the two proton’s center of gravities after going through a covalence process of Hydrogen’s electronic shells. 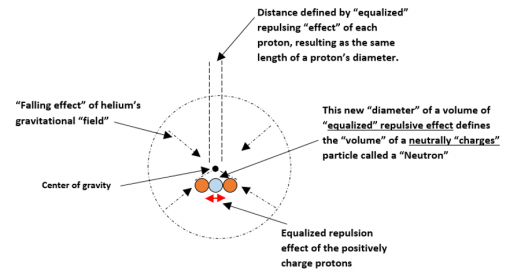 Both protons having the same charge intensity equalize their repulsion, resulting in a distance between them equal to each their diameter. This distance represents the diameter of a new defined volume of “space” where “repulsive energy” is neutralized. This new volume becomes a “Neutron” particle. And the element resulting is a Helium-3 atom with 2 protons, 1 neutron and 2 electrons (or a “full” energetic shell). To produce a Helium-4 atom, this Helium-3 would have to “capture” a “free neutron” that doesn’t exist at the time. So what was possible? We have to keep in mind that the only “effects” available to produce anything were “gravitational” and “covalence” effects. When “covalence effect” occurred, using the equalized energy density of hydrogen shells, it produced a “molecule”, leading to galactic clouds. And when “gravitational effect” occurred, using the “velocity” of each hydrogen atoms, it produced an atom of a new element. The question becomes: What decided which “effect” would prevail in such an event? Considering the few conditions existing at the time, it’s easy to solve the problem. We know that all hydrogen atom were “traveling” on individual straight trajectories in all directions. So some of them made face to face collisions, while others just “brushed” against one another. We mustn’t forget that what is really “traveling” is the center of gravity surrounded by the space volume deformation; and not the contained particle itself which only follows the “container”. And we know that when two particles, inside their personal volume of deformed space, collides, the deformed space volumes slightly continue on their trajectory while the particle is stopped. We can see this reaction in the “Bullet cluster” photo that is inappropriately used to “suggest” dark matter’s existence. The "fact" would be that the suggested "dark matter" would simply be "volumes of deformed space". So when hydrogen atoms collide face to face, the centers of gravity of each hydrogen, increasing velocity on their trajectories, unite each other, producing a new mutual center of gravity for the new formed nuclei, and both gravitational fields becomes one, increasing its volume. On the other hand, when the deformed space volumes only brush one against the other at stable velocity, there’s no collision of particles, and the result is a simple “covalence effect” of electronic shells. Note that the energy density of space, at the time, demands that the particles (in fact their center of gravity) do not travel at an excessive speed. So face to face collisions of Hydrogen atoms, with enough speed, to produce an extremely unstable Diproton (two protons without a neutron), would not occur very often (probably, not at all, since Diproton is a “deducted” possibility). So now, we have Hydrogen and Helium-3 isotopes, and hydrogen molecules floating in space. What can happen next? We know that Hydrogen molecules gas is unstable unless the gas is at a very high temperature. At the epoch we are describing these events, the temperature is the highest possible; so those molecules should be stable. We also know that hydrogen and Helium-3 atoms are stable. So the only “objects” we can work with, are these three objects. And it is only after this event that, for the first time, Deuterium could appear by fission (decay) of a Lithium-6 atom producing the first Helium-4 atom. So Deuterium would appear at the same time as Lithium-4 during the Big-bang nucleosynthesis. 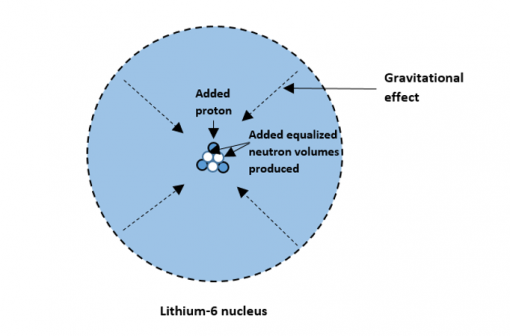 As you can see three additional neutrons (in blue) are “created” by proton’s repulsive charge effects while “falling” to the center of gravity, where stands the only existing neutron of the Helium-3 atom. The result is a Lithium-7 isotope. And, once again, a Deuterium atom can result from the fission (decay) of a Lithium-7 isotope, producing a Helium-3 atom. The question becomes: What could have produce those fission at the time? We know that Lithium-6 and Lithium-7 atoms are stable but have an “unexpectedly” low nuclear binding energy per nucleon. And we also know that a lot of electromagnetic waves (rays) exist to “excite” any of those Lithium-6 and Lithium-7 atoms, which is enough to destabilize them provoking their “decay”. Lithium-7 is by far the most-common isotope, making up about 92.5 percent of all natural Lithium. Which simply means that there was a lot more of Hydrogen and Helium-3 atoms that collided face to face, than there was Hydrogen atoms colliding with hydrogen molecules. The “fact” is that if it would not have been this way, galactic clouds would not have been able to form as they did. But what was the reason behind that less produced event? In other words: What “protected” more molecules than Helium-3 atoms from Hydrogen collisions? The answer is simple: Helium-3 atoms had a far greater and intense “gravitational effect volume” than hydrogen molecules had. Once again, “gravity” was the prevailing “effect”. "And, once again, a Deuterium atom can result from the fission (decay) of a Lithium-7 isotope, producing a Helium-3 atom." Remember that this "decay" is a rare event in nature; which explains why Lithium-7 is far more abundant (92,5%) than Lithium-6 atoms. Two “half full” energy densities in a “full” K electronic shell. Why does the electronic shell of hydrogen has only a “half” electronic density? Obviously, the answer has to be related to the origin of this electronic shell, which in fact, is an electronic "field". We have explained the origin of the electron by being “created” when two “gamma rays” collide, separating its “upward frequency” from its “downward frequency”, and thus producing two small volumes of contrary “swirling kinetic energy”, without center of gravity, called an electron and a positron. This “swirling energy” is, naturally, half of the initial “gamma ray’s energy” (half its frequency). And we know that, at that epoch, the whole universe was already electromagnetic, which represented all diluting energy that existed at the time. Consequently, this universal energy possessed a certain “density” that was universal. As we know, a “gamma ray” is simply a “vibration” going through the universal “electromagnetic energy density”; which means that when a gamma ray is separated in two equal energy intensity, it is also divided in two equal lower densities diluted in the existing "space metric". Which results with an electron, in fact, an electronic volume of energy, in other words an electronic “shell” that possess half the energy density of its “electromagnetic surrounding”. 2) The “covalence effect” which is, in fact, simply a necessity for the electron half density field (the shell) to equalize its energy density to the full energy density of its surrounding universal electromagnetic space. This also explains why a helium atom has to add a new electronic shell, when capturing another hydrogen atom. Because the new “half energy density” cannot add itself to the existing “full energy density” (equal to the surroundings) of the helium’s shell; this new energy simply “surrounds” the existing shell, creating a new “bigger shell” with even less density than its surroundings. To explain the “even less density” of the new created shell, there’s only one possibility; which is that the “corridor” allowed to the new shell, is defined by the increase of the deformed volume of space-time created by the added proton at the nucleus. From this point on, it seems that the “gravitational effect” will control the densities possibilities (the filling aspect) of further electronic shells because the newly added electronic density is spread through all the constantly increasing “added” volume of the “gravitational effect” as we've already seen in drawings of several previous posts. We now have to make the relation between the number of electrons (with an invariant density) of each electronic shells of different atoms, with the “extended volume” of each “gravitational effects” occasioned by one added proton’s mass-energy (an invariant intensity) to a nuclei. We might, then, find the actual extending power of the “gravitational effect” related between the “pressure” intensity on a center of gravity, and the surrounding existing energy densities at certain epochs. But this, I leave to mathematicians. I wish everyone a wonderful and happy new year 2018. As you must have been aware by now, I just love the path we’ve covered so far, by using only the “motion” basic to describe our universe’s evolution. The logical introduction of the “gravitational effect” related to the appearance of the gluon appeals to me greatly and simplify enormously the understanding of the universe I observe. But there’s no way I can accept it fully, before I can find a simple explanation for what is called: the “Binding energy”. Why is the total “mass-energy” of an atom “less” than the sum of the “mass-energy” of its components? If my proposition cannot supply a logical and perfectly clear answer to this question, there’s no way that I can accept it. And, for now, I really don’t know if it can. Since the total mass of the bound particles is less than the sum of the masses of the separate particles by an amount equivalent (as expressed in Einstein’s mass–energy equation) to the binding energy, how can a “non-present energy” (mass equivalent) bind anything? The proposition is simply ridiculous; “missing energy” cannot do anything. But being “ridiculous” isn’t an enough satisfying argument for my mind; it would look too much like using the argument that: There cannot be a “before”, further back in Time, than the Big bang, which is just as ridiculous. Needless to talk about finding the North to the North pole. So let’s try to settle it intelligently. We have previously observed that the simplest way to produce a new element, was to simply add a proton in the nucleus of the existing element. And usually, the universe uses the simplest means as possible to get what it wants. Which means that the first element to exist was the Hydrogen atom possessing one single proton as its nucleus. This also means that neutral Neutrons didn’t exist before it was “needed”; which was when positive protons started to “unite” by “gravitational effect”. We’ve already seen that a neutron is simply the “consequence” of the presence of two positively charged protons, and that it naturally “appears” in-between the repulsing protons, when a hydrogen atoms captures another hydrogen atom to produce a helium-3 atom. And we can already define a shell occupied by two protons around the neutron “core”. Consequently, no “free” Neutron can exist at this epoch. Which means that Deuterium and Tritium cannot be produced yet (guess I'll have to write another d.... book). We now clearly can observe that the “core” of a Lithium-6 nucleus has increased, and is now defined (occupied) by three equalized repulsive “fields”, considered as “neutral fields” called Neutrons. And still, there’s no possibility that a “free” neutron can exist at this epoch of the Big bang nucleosynthesis. Which means, again, that no Deuterium, nor Tritium, can exist. And even if Lithium-5 could be produce before Lithium-6, it would decay in Helium-4 by one "stable" proton emission. And we get a Beryllium-9 nucleus as a result. 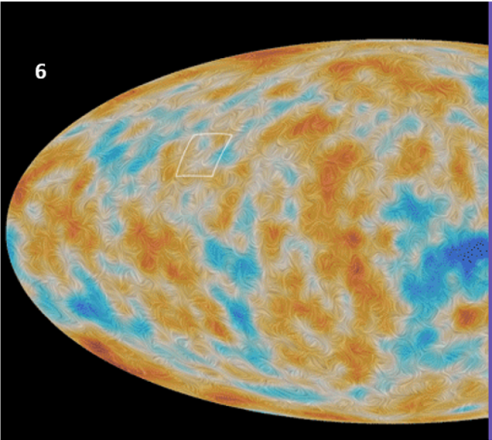 We also have to note that the two added neutral “fields” produced stand outside the nucleus “core”. This could be significant. Let’s verify the Beryllium atom. a)	Beryllium is unique as being the only monoisotopic element with both an even number of protons and an odd number of neutrons. There are 25 other monoisotopic elements but, contrary to Beryllium, all have odd proton numbers, and even numbers of neutrons. c)	Beryllium-9 is a stable element. Cosmic ray spallation is a naturally occurring nuclear reaction causing nucleosynthesis. It refers to the formation of chemical elements from the impact of cosmic rays on an object. Cosmic rays cause spallation when a ray particle impacts with matter, including other cosmic rays. The result of the collision is the expulsion of large numbers of nucleons (protons and neutrons) from the object hit. 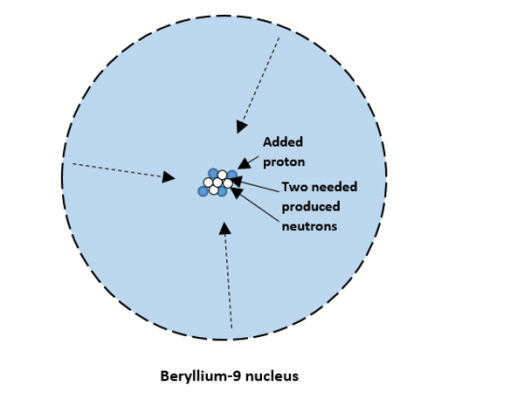 So we can imagine that a Beryllium-9 nucleus, hit by a cosmic ray, could result in producing a Lithium-6 nucleus plus a Tritium nucleus which would decay into Helium-3 by beta decay. Furthermore, we can understand that before producing two “Neutrons” to stabilize the new addition of a proton producing a Beryllium-9 nucleus, it would produce one neutron resulting in a Beryllium-8 nucleus decaying by emitting a Helium-4 nucleus leaving a helium-4 residue; thus making Helium-4 the most important quantity of Helium in the Universe. Coming back to what we’ve found yet, we must remember that “mass-energy” is a “pressure”, put on a single point of space, pushing this point back in Time. The further back the point is pushed, the more increasing density of energy opposes a resistance to its backward stride. Which means, for example, that if the mass-energy “pressure” of one proton can normally push a “center of gravity point” one inch back on its Time line (the Time arrow) in a certain energy density environment, when a second proton of the same “mass-energy” starts pushing the same center point in a denser energy density, it will not be able to push it at the same “one inch” distance, but on a shorter distance. And the denser the energy density becomes, the shorter will the proton’s mass-energy” push the “center of gravity point” backward, on the Time arrow. In other words, five protons pushing together on a center of gravity will not push it back five inches (one inch each) but quite a bit less because of the environment’s increasing density of energy. This explains why the “total push” (total mass-energy) of components is less than the sum of each components defined push (mass-energy). Furthermore, the event is not at all abnormal in an expanding space decreasing energy density situation as observed in our universe. Finally, the problem wasn’t a real “sticky” one. “Expansion” and “gravitational effect” still solve all difficulties. I'll try to find a "real" problem next time. Sorry about this. The "real" problem wasn't very hard to find; because my new explanation for the origin of neutrons affects directly the Standard Model. Which means that I have to change some parts of my opinion on the Birth of our universe. a) Kinetic energy cumulated during Planck’s epoch by a rotating motion. b) When the difference between centripetal and centrifugal effects became too great, the bi-dimensional surface created was ripped in two, projecting ½ in all directions (centrifugal), creating “space”, and recoiling the other ½ (centripetal) in a unified full spinning virtual “object”. The Time of this event was 10^-43 sec. c) The radiating period, expanding “space” in all directions, lasted until 10^-36 sec. Then the recoiled unified full spinning "object" (gluon) reappeared in “space” inserting a defined “toward the center” (TTC) topology volume, in the “all direction” expanding space. d) At this moment space had attain a volume of 10^-15 meter which was adopted by the TTC new topology has its “field”; this TTC volume was later observed as being a gluon. And space kept on radiating. And this is where things refuse to get more complicated since the nuclear strong force isn’t needed where TTC volumes have the same effect. Which means that the QCD “colour” explanation for the "strong force" is obsolete. But, then, what happens with our initial gluons? e) Gluon “surfaces” have their “back” ripped from their “front”, which both recoil on their proper energy producing a defined “energetic volume” standing at the center of the TTC gravitational “field”. Space between these TTC "fields" keeps on expanding. What are those new defined “energetic volumes” which one is the anti-particle of the other? Are those new defined “energetic volumes” quarks/antiquarks or are they simply protons/antiprotons? I hate it when I’m stuck in eliminating accepted experimental results. I hate confrontation. But in this case, it is necessary, I guess. So let’s check it out. The evidence was for the “six flavors”; so what are they? Which means that quarks could simply be different “quantum numbers” assigned to one single subatomic particle that would continuously equalize its “mass-energy density” with its environment’s energy density. What would, then, be the outcome? "Front-gluons" would be Protons and "Back-gluons" would be anti-Protons. Both particles would emit “mass-energy”, six successive times, to equalize their energy density with the increasing dilution of the energy density of their environment produced by expanding “space”. The results of equilibrium would be followed by 6 protons (P1 – P2 – P3 – P4 – P5 – P6), and 6 antiprotons (AP1 – AP2 –AP3 – AP4 – AP5 – AP6). So what happens when we make the changes to our previous drawing, showing the decay process of quarks/antiquarks that I reproduce here? Now we have to verify the difference it makes to the story. 1) What we have now is simply different massive protons and antiprotons. 2) All other “energetic volumes” are simply volumes of different “energy density” released by the adaptation of protons to their environment’s energy density. Note that we have a second generation of gluon that appears when one P3 and one AP3 join together producing a P4 and an AP4. Unequal P6 (4) particles against AP6 (3) particles. If we compare all this to the standard model, there are more Strange quarks (P4) than anti-Strange quarks (AP4); and more Up quarks (P6) than AntiUp quarks (AP6). Which solves the “asymmetry problem” between particles and antiparticles. Furthermore, we’ve eliminated all “magical forces” freely qualified “fundamental” that aren’t needed nor “observed” in the universe. We also know that Taus, Muons and electrons followed the same “mass-energy density” adaptation to the same progressively decreasing environment’s energy density. As for the Z and W bosons, they are quanta of energy related to "mass-energy" (magnetism) just as the Photon is a quantum of energy related to electromagnetism, and the neutrino is a quantum of energy related to "expansion". So, what exist at the end of the inflation period are simply Protons and Electrons. And Protons will then start to “capture” electrons, producing hydrogen atoms of which we already saw the evolution that results in different elements. All these "events" supervised by two "field" motions: a) the universal expanding space field and b) encrusted gravitational fields. But the experiments from which was concluded that a nucleus had an "interior structure" cannot be wrong; so I'll have to look deeper into it. What we know is that electrons (muons and Taus) were "fired" towards atomic nuclei, composed of protons and neutrons. Which confirms that a nucleus is a "composed" particle. Was the experiment made on one single proton (hydrogen atom)? What is known about the mass-energy of a Proton? But we now know that those differences in volume represents the differences in the “metric of space” related to “when” each particle appeared in the universe. So, according to the decreasing metric process, the “reality” might be that the Up quark could be “bigger” than the Top quark even if it is less “massive” (possesses less mass-energy). 2) The “mass-energy” of each quarks is related to the “energy density” of its environment. Which means that the different “mass-energy” of each quark would be in their “energy densities”. But then, again, we know that the size of each different quarks are the same (more exactly: is irrelevant); which means that to decrease its “mass-energy density”, a quark “confined” inside a fixed volume of 10^-15 meter, has to “get rid” of a part of that mass-energy outside of the fixed volume to follow the decreasing density of the environment of its “confined” fixed volume. We also know that the quanta of “mass-energy” released by quarks are different than a quantum of “kinetic-energy” which is a neutrino, and also different from an “electromagnetic-energy” quantum called a photon. Which leaves us with the only observed energy quanta left, called W+, W-, and Z quanta. All those, beside the neutrino, are classified as Bosons which means that they possess a “full spin”. How can a “half” spin quark, release a “full” spin energy quantum? And this is when I get “frustrated” and ask myself: “What the hell is a “spin”??? A spin is simply a “mathematical value”. The problem is that this “mathematical value” is given to “something” that cannot be “defined” exactly. It is a value that represents two things: a) the direction of an orbit and b) the direction of a rotation. And “orbits” and “rotations” aren’t, at all, the same things. So when we consider a “particle” like a quark or an electron that “rotates” somewhere inside a “gravitational volume”, we get only “half” of the “spin” information (we know it rotates) and we call this particle a Fermion. Neutrinos also have “half” spin but not for the same reason; their “full” spin was ripped in two parts, as we already have seen and a neutrino doesn’t “rotate”; it simply follows a straight “trajectory” (which relates to orbiting)and is also only a “half” information. But when we observe a quanta of energy “emitted” from this “gravitational volume” of 10^-15 meter, we observe a “rotating” quantum of energy projected in a definite trajectory; which means that we get “full” information (rotation and orbit) regarding the spin of that particle that we call a Boson. Which explains the “full” spin quantum of energy when emitted from a “half” spin “confined volume” particle. So, coming back to our quarks, we know that they “decay” one “inside” the other; in fact, they “decay” inside their “confined” fixed volume of 10^-15 meter. Which represent the whole chronological story of real “matter” particles. We have to admit that our own drawing explanation is more logically comprehensive that this last “scientific” one. What makes scientists say that a proton is made of three quarks (2 Up + 1 Down)? The answer is rather obvious: it’s because of the mathematics to explain chromodynamic. Which means that it has no obvious relation to “reality” but only a relation with the mathematical “interpretation” of observations imagined at first by Murray-Gell-Mann. But can there be another more “realistic” explanation for those “three portions” of a proton? Let’s look, once again at our drawing of a proton, and add to it the Time factors, while considering specifically the “stabilized” volume of 10^-15 meter, which can only be in two possible motion “states”: 1) positive rotation, and 2) negative rotation. 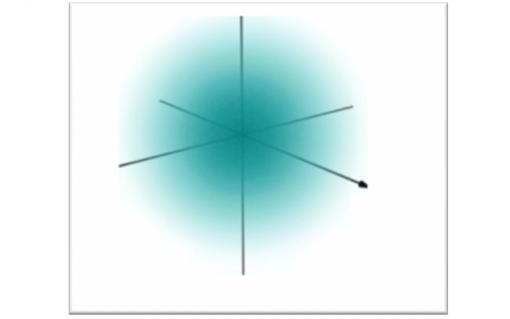 Those two “rotation” possibilities have to be “present” in the particle shown. But on top of those two “possibilities” there’s a “stabilized” possibility that adds to them; and we call that third “possibility” a “neutral” state; in other words, a “non-rotational state”. Naturally the “negative” (contrary) representation of this Proton would be the anti-Proton; which is the reversed disposition of the three “states” possibilities. As for the “stabilized” possibility between two positive or two negative particles, it becomes obvious that it is the result of the “Time flow’s” particles repulsing influence, when opposed to each other. They “stabilize” between both particles in a volume equal to the diametric of each particles. We’ve seen this already. So whatever is “inside” a proton, it’s the “Time factor” that defines its “three motions possible components”. 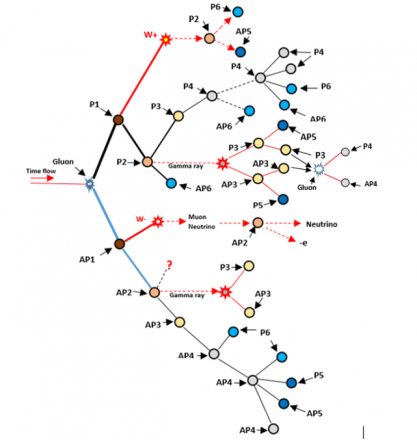 As for ransom distributed quarks, antiquarks and gluons inside those particles, it’s plainly illogical to the universal evolution process; even though observations might give that “distribution impression” caused by the will of an observed to pinpoint “particles” where they cannot exist. Finally, chromodynamic might be needed for a mathematical representation of observations, but the universal “reality” doesn’t need it at all. And our proposition of the proton, being the fundamental particle of “matter”, still stands just as our explanation of the “creation” of the neutron “particle” stays the more logical process. Notwithstanding the “reality” of everything’s origin, and “connexion”, from and to, the center of the “gravitational effect”. I hope I didn’t forget anything. Ah yes! This also explains the fact that “mass” is exclusively “kinetic energy” oriented towards a center of gravity; which is confirmed by the fact that 99% (in fact a 100%) of the “mass-energy” of a Proton is the “inner” kinetic energy of that Proton. I could also add that the structure "inside" a proton has been confirmed, recently, being similar to the structure of the electronic shells of an atom; which is exactly what we found here. How « energy » became « matter » with the simple complicity of “expansion” and “gravitational effect”. 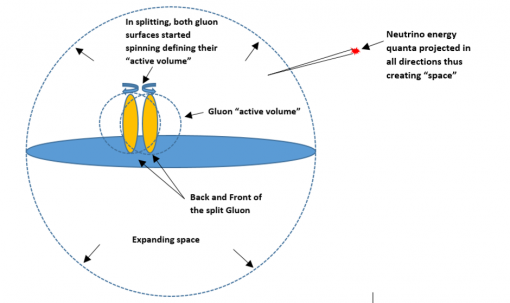 We’ve already seen how the gluon becomes a Top quark by the Gluon’s surface split caused by the energetic expansion of universal space (kinetic energy from Planck’s epoch). Then the gluon’s field of 10^-15 meter, containing the “Top-quark-mass-energy-volume” at its center, has to stay in equilibrium with the decreasing energy density of its environment (universal space). To do so, the “Top-quark-mass-energy-volume” has to eject a quantum of its “mass-energy” observed as a W+ boson. The process is done simply by splitting its “center of gravity” in two parts, each taking possession of a quantity of the total “mass-energy”. As we can see it’s mostly, if not always, the center of gravity of the Gluon’s field that is affected by the decreasing energy density of the universal environment. 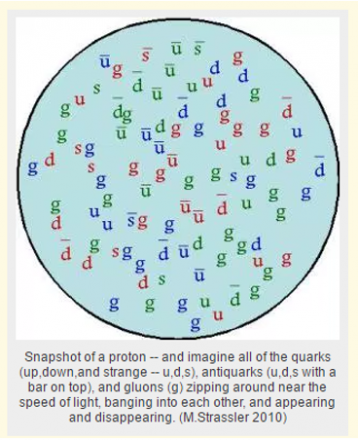 The now “less-massive-Top-quark” is, then, classified as a Bottom quark; which is, as always, simply a volume of “mass-energy” contained at the center of a Gluon’s field. At this moment Gamma rays appear all around those “Bottom-quark-mass-energy-volumes” as we’ve also seen already. These gamma rays are “electromagnetic-energy-waves” (vibrations) that fills the universe, including the Gluon field around the centered “Bottom-quark-mass-energy-volume” from where it is produced. The “neutrino-kinetic-energy-radiating-period” of the Big bang is now overwhelmed by manifested “electromagnetic-energy-waves” (vibrations). The universal space, continuing its expansion, keeps decreasing its “neutrino-kinetic-energy-density” that is now added with “electromagnetic-energy-density”. So at this point, it’s the Bottom quark’s gluon field that has to expel energy to keep equilibrium with the universal environment. This time it expels, from the gluon field, the surrounding “compressing” electromagnetic-energy as, a gamma ray, which makes the Bottom quark able to split its “center of gravity” into a less massive “Charm-quark-energy-volume”. This leaves a mass-energy “residue” enough to represent an “antiUp-quark-mass-energy-volume”, both of them gaining a “center of gravity”. The following decaying process of Charm quarks becoming “Strange-quark-mass-energy-volumes” don’t imply anything else than the gluon field’s “mass-energy”. They all decay in “quark-energy-volumes”. The expulsion of neutrinos or Taus, Muons and electrons, occurs within the decay process of W- “mass-energy-volume”, expelled by “antiTop-quark-mass-energy-volumes”, and afterward, by “antiBottom-quark--mass-energy-volumes”. Which, somehow, relates "negative charges" to "antiquarks process" while "positive charges" relates to "quarks process". Which will become a Hydrogen nucleus when the “gravitational effect” surrounding it, captures a volume of “low-massive-negative-spinning-kinetic-energy”, that doesn’t possess any center of gravity. This “absent center of gravity” energy volume gets its origin from Gamma ray collisions as being “half” of the Gamma wave frequency, like we saw already, and which we catalogue as Electrons, Muons or Taus, depending of their “mass-energy-density”. The “fact” that each of them represent only “half” of an electromagnetic frequency, is responsible for the need of “two” low massive negative spinning kinetic energy (electrons) in order to “fill” an atomic shell “energy level” around a Proton nucleus; which is, evidently, an “electromagnetic-space-volume” just as is the universal space field. It's obvious that the "filling condition" relates to the energy "density" of the electronic shell and not to its energy "intensity". The only difference between a “gluon field” and the “universal field” resides at the basic “radiating level” of the neutrinos. In the “universal field”, kinetic energy propels in “all directions” while in a “gluon field”, it propels toward the center of gravity. As for evolution of “matter” itself, we know that “filling” an electronic-shell-energy-level is called “Covalent bonding” and produces “molecules”, while, when fusion of Proton’s center of gravity occurs, we get a new element. And, like we already saw, fusion of “positive” Proton’s centers of gravity produces a volume of “equalized positive repulsion volume” which, since both repulsion's are equal, possesses a volume equal to the distance between each repulsing Proton. Which distance is the same as a Proton, since both identical energetic repulsion's are equalized by intermingling. This “consequence” of positive repulsion, we call and observe as a Neutron”. And thus “matter” is “created. Energy density versus energy intensity. What if the energy effectiveness was related to its “density” rather than to its “intensity”? If so, it would mean that the intensity of energy is an “invariant” while the “effectiveness” of energy depends solely on its “density”. For example, the energy “density” of a gamma ray is greater than the energy density of a X ray since the gamma ray wavelength is shorter. This would mean that the frequency of the rebounds of a gamma ray vibration is a lot greater than the frequency “rebounds” of a X ray. Meaning that a gamma ray “hits” faster (more often) than a X ray. The “efficiency” of a gamma ray versus a X ray is similar to using a “jack hammer” instead of a “hand hammer”; even though the “hits”, themselves, have the same “intensity”. It’s the frequencies of “hits” that produces the “efficiency”. 2)	Towards one single point (gravitational effect). In this sense, all other “kinds” of energy are “collateral damage”. Regarding the “expansion” related kinetic energy, the “invariance” of energy’s intensity would explain the “invariance” of light speed, while the “variance” of its density, caused by expansion, would explain the different wavelengths, thus the different frequencies relating to different “efficiencies” of electromagnetic rays. As for the “gravitational-effect-related-kinetic-energy”, can the “invariance” ” of energy’s intensity be possible in a gluon field (surface portion of pro or anti gluon)? 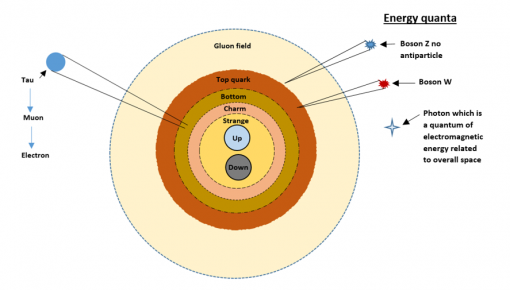 We have to look deeper into the “overall energy” of the gluon field. Expelling “electromagnetic rays” doesn’t affect the “overall” energy density of a gluon field since those “rays” are produced (and part of) to the universal electromagnetic energy density by the “surrounding space”, as well as the “space” of the gluon field. All of “space” is electromagnetic. Expelling “mass-energy” as W bosons doesn’t affect the “overall” energy density of a gluon field since it stays inside the gluon field. As for exchange of “Photons”, it doesn’t affect the overall density energy of the gluon field since it refers to the electromagnetism of “all” space itself. In fact they compose electromagnetic rays. Which leaves us with electrons and Z bosons. Electrons are definitively related to electromagnetism since their origin is the Gamma rays. So it is part of the universal “space” energy. In 10% of the Z-decays, charged lepton-antilepton pairs (electron-positron) are produced (universal “space” relation). In 20% of the cases Z decays into a neutrino-antineutrino pair (universal “space” relation). In 70% of Z decays, a quark-antiquark pair is produced (Gluon field “space” relation). Funny these relative portions of 30% related to "universal space" and 70% related to the "gluon field's space". It's almost exactly the same proportions applied to "contrary" components of our universe which gives 30% relative to "matter" plus "dark matter" and 70% relative to "flat space" or "dark energy". I'll have to look deeper into this someday. But all this doesn’t explain “why” the Z boson came to be. What we can observe in previous notes is that all particles, beside quarks, are related to “space” and show an increase of probabilities in decays towards the “quark state”. Quarks, as we already know, are related to “Time” rather than “space”. But the Z boson is a “neutrally” charged boson; meaning related to “Time” and “space”; and corroborating this is the fact that the Z boson is its own antiparticle. Which means that it is an “overall” product of all “space” that becomes affected, in 70% of occasions, by the “Time factor” in a gluon “space” volume. Time factor, which we know, is what affects the energy density of quarks. The reality is that the exchange of a Z boson between particles produces a transfer of momentum exclusively from a Top quark; and since a body's rate of change in momentum is equal to a “net force” applied to it, we can say that an exchange of Z boson adds or reduces the “speed” of a particle in space. In relation to the Z boson date of appearance, shortly after the Top quark, we can imagine that the life-span of the Top quark prevents it from mostly traveling at all (in fact its progression through space is “blocked” by its "mass-energy"); which annuls its “speed energy” that has to be expelled (expressed) as a “momentum quanta” that we observe as a Z boson. The Z boson becomes, then, the “expelled momentum” through universal “space”, of the blocked drifting of the “Top-quark-energy-density-volume”. 70% of the time it doesn’t leave the gluon field “space volume” but produces a “meson-energy-density-volume”. The other 30% of the time it relates with the “space” of the gluon’s field. Finally, in both cases of energy, the energy intensity is an “invariant”; and in both cases, only the “density” varies, consequent to the expansion of universal space. The basic fact is that “space” is “space”, whatever the orientation its energy has. “Space” inside a gluon field is composed of basic metric volumes with a diameter of 10^-35 meter, just as universal “space”. The only difference is that it doesn’t expand. And this drawing helps us to “visualize” the “real” structure of the universe as having two layers of “energy”. -The first “layer” (in grey) was produced at the Big bang occurring at 10^-43 sec. It was animated by “straight” oriented kinetic energy in all directions. -Then appeared the gluon surface particle, at 10^-36 sec, with a contrary oriented energy called “magnetism”, animated by kinetic energy oriented “straight” toward one single point. 1-The universe became electromagnetic and kept its dynamism. And the basic metric of “space” continued reproducing (expansion continued). 2-The volume of 10^-15 meter delimited the “gluon’s field” that became a stabilized “space” volume. Being perpendicular to each other meant that each “levels” of the new “composed” universe kept their proper particularity. The first appeared “level” kept being “energical active”, while the second added “level” kept being “energical passive”. We call that passive energy, “mass-energy”. Both “space” levels were now electromagnetic and they would exchange “energy quanta” when needed. Those quanta are called Photons. The “expanding universal level” (first layer) was the possessor of “active kinetic energy” meaning “expressed motion” and when “motion” had to vary its “speed”, it would either absorb or expel a “motion quanta” called a neutrino. On the other hand, the “stabilized-space-volume-level” (second layer) possessed a definite “mass-energy” density at its center; which would have to keep in equilibrium with the decreasing “kinetic energy” density surrounding its “stable-space-volume”. To keep this equilibrium, it would have to “expel” quanta of its “mass-energy” from its center of gravity that we observe as W bosons. In fact, all the mass-energy inside a gluon field is located at the center of gravity. 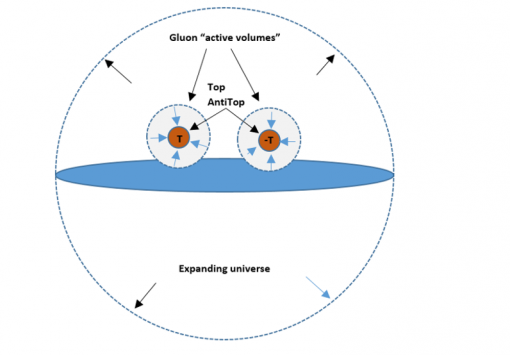 The rest of the gluon’s volume is simply imprinted topology. The Z boson is a “mass-energy-motion-boson” ejected by the Top quark when its “traveling” energy was “blocked” by mass-energy applied to its center of gravity; in fact, to the center of the portion of ripped front from back of the “traveling” gluon surface. As observed since the beginning, the gluon’s field center of gravity is the solely important aspect of the “gravitational effect”. 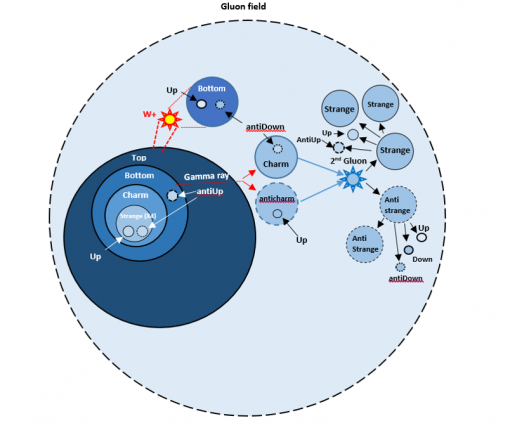 It is the only part of a gluon’s field that “interacts”. The main point of all this is that our electromagnetic universe is composed of “two contrary oriented energy” superposed perpendicularly to each other and they, sometime, exchange some of their energy quanta when needed. I’m getting a “funny” feeling. I “feel” that things are getting “clearer” in my mind, but I can’t “see” it yet. I don’t like not “seeing” clearly. I guess I'll have to "hurry" on. Last edited by Andrex on January 24th, 2018, 4:47 pm, edited 1 time in total. Even when we install only half the decays that occur inside one Gluon’s field (antigluon field have contrary particles) and check the Bottom quark, we can see it surrounded by all sorts of massive particles; which is what we observe in colliders, making the Bottom quarks hard to study. We can also have an idea of the sum of quarks that are inside a Proton which has, and is, the overall space volume of a gluon’s field. The antigluon field would be an antiproton. I mentioned only “half of the decays” because I didn’t include the antiTop decay process, which uses a process resulting in slightly different particles. But it has the antiparticle results of what we see here inside the Top quark particle results. The difference in particles is the result of the W- boson which emits a Muon and a neutrino that become an antiBottom quark which, then, emits a Neutrino and an electron. As for the gamma ray emitted by the antiBottom quark, the resulting particles are the same as the Bottom emitted Gamma ray; meaning a Charm and an AntiCharm quarks. There is no such thing as an “anti-gamma ray”. The AntiStrange quark produces two Up, one Down, one antiDown plus two more antiStrange quarks. No wonder that our scientists find all sorts of “virtual” particles inside a Proton. But our way of looking at it, as a logical chronological succession of events, permits us to better “understand” the relation between those “virtual" particles and the energy involved. 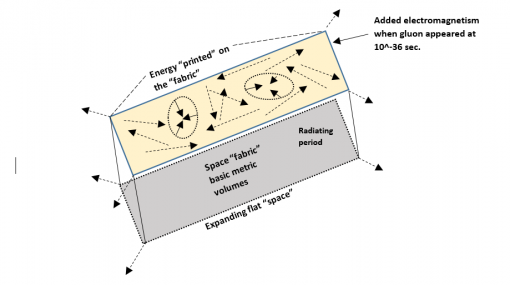 Specially the two energy “layers” imprinted in the “space” fabric. If we compare this drawing to our previous hydrogen nucleus drawing, we can see that the structure of the hydrogen nucleus is the result of the structure of the Top quark decay. This would mean that all particles outside this Top decay structure are considered as "virtual" particles; while those inside the Top decay structure are considered as the "real" Proton structure components. It is still getting "clearer" in my mind. I'll be able to take a break.